Interrupt: When a non-Army character would be killed, save it. 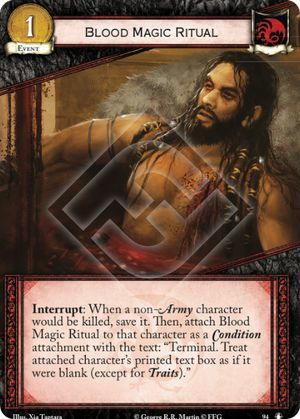 Then, attach Blood Magic Ritual to that character as a Condition attachment with the text: "Terminal. Treat attached character's printed text box as if it were blank (except for Traits)." If used to save a character with the "No attachments" keyword, it will save that character but will be discarded rather than attaching (just like Risen from the Sea).